David Petersen: Eric, Thanks for taking the time to do the story and for doing the interview. Let’s start the interview with your artistic beginnings. When did you first start thinking about art as a career? Were you a child who knew you wanted to draw for the rest of your life, or did a specific moment get you on your creative path? 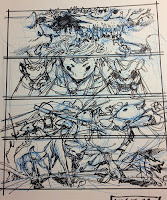 Eric Canete: Thanks for having me. Doing the story was probably the most notable highlight in my career in recent memory - it was such an honor and so much fun to do. I was prompted in a career in art by an older cousin, Ferdinand, who drew really well when we were young. I was very jealous of his ability and recall him being able to draw anything in any style - from fashion illustrations to Star Wars; anything he saw, he could draw. So whenever he would doodle, I would always try it for myself - with less accomplished results. But that friendly competition really started me in the physical act of trying to get better at drawing. From there, it was just being influenced by all the cartoons and comics I was looking at and watching at the time. 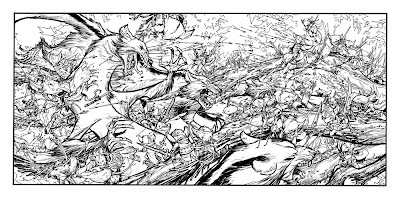 David: While you've drawn comics in the past, your background and day jobs are in animation, storyboarding, and design. Obviously comics and storyboarding have similar qualities, but from someone who does both well, can you talk about what makes them very different from one another? Eric: Like you said, there are a handful of crossover in both disciplines. It's sort of funny that, whenever I do comic book pages, I draw them almost as if I'm storyboarding. I know many of my peers are really involved with page lay outs and what helps best draw the eye from panel to panel - there's a whole science to it all. I used to really invest in learning those theories, but these days, I just draw my pages like I'm storyboarding. The biggest difference, when it comes to drawing comic book pages versus drawing storyboards for animation, is the sheer pencil mileage involved in doing an action adventure storyboard for the screen. Every beat has to be spelled out, every acting nuance has to be drawn. Whereas in comics, the artist can expect the audience to fill in between the lines as to what happened from one panel to another, animation can't do that - it's simply not good cinema. There are instances when you can 'jump time' and not show Point A to Point B, but for the most part, ALL action has to be spelled out. That takes a lot of drawing. David: While I like giving the freedom to Legends of the Guard contributors to come up with their own stories, you specifically asked me to give you some story direction and outlines. I provided you several story seeds including: a story about a mouse with a flaming sword, a mouse who carved puppet children for himself, trees that could talk to animals, and an old world mouse who first brought fire to his species...but you opted for the one I suggested as a re-telling of an Aesop fable with a war between mice and weasels. Was there any reason you chose that story over the others? Eric: It was such a HUGE deal for me to be involved in Legends of the Guard. I asked for your help in writing brief story ideas because I didn't want to miss the overall tone for the series. I'm a novice writer so I can't say I'm 100% comfortable doing things on my own yet, and it takes me so long to ideate on a story that in this particular case, I just really wanted to get the task of drawing without the worry of being too far off center with the story. I figured, if I went straight to the source for what's a good fit tonally, then it's that much easier and sooner that I can get to the task of drawing. As far as choosing this particular story over the others - it was the challenge of it all. 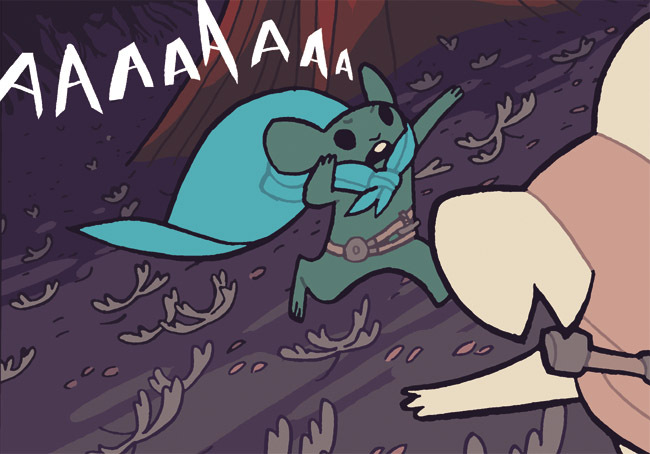 I had the opportunity to draw an epic battle between mice and weasels, and I got excited and jumped all over it. 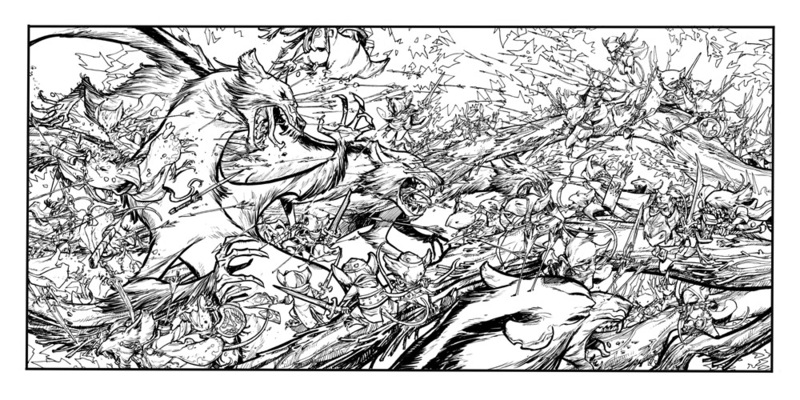 I figured an artist - even within the context of this series - doesn't get a chance to do that every day. 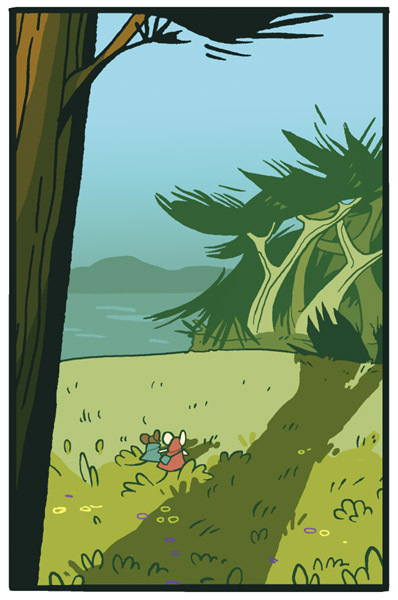 Also, I really wanted to draw pages that was somewhat out of my comfort zone. Between all the synopses you had written, choosing this story really offered that opportunity. David: In the development of your thumbnails, you asked if I could give you more space for a splash page...and it turned out, I was able to shift things around and offered you a two-page spread (the first in Legends of the Guard). This spread is incredible! And does exactly what a two page spread should, give the reader a sense of awe, grandeur, and scope. 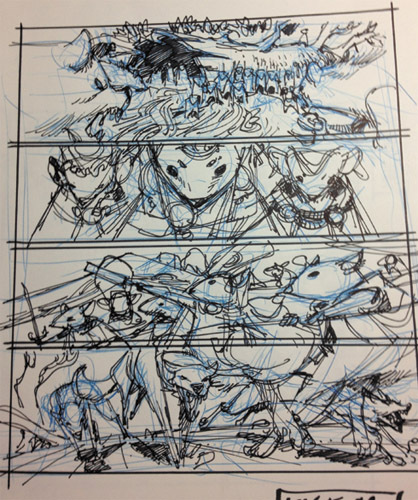 You are known for dynamic designs, but this must have been a killer series of pages to layout, draw and ink! Describe what it was like to work on them. Eric: Wow! I didn't know you accommodated that double page lay out. I'm so grateful! Your description of the hows and whys of doing any huge spread is exactly the motivation for my request in having it. 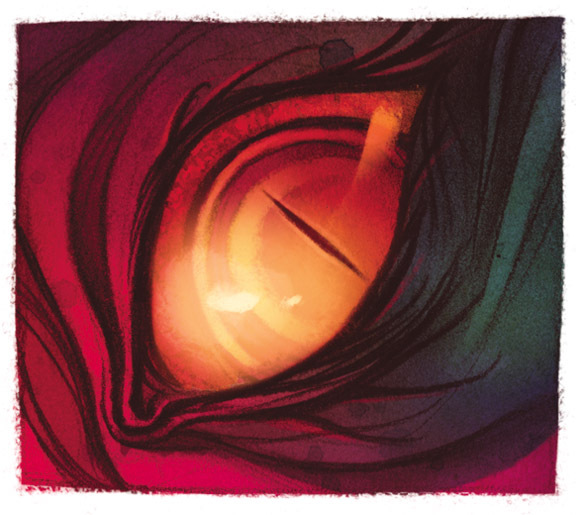 I try to deeply immerse the reader into the feeling of the story I'm drawing. 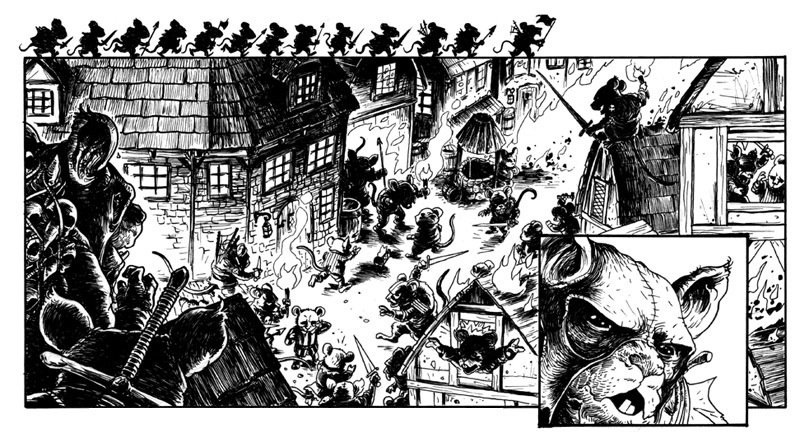 In this specific case, the story called for an epic battle of heroic warrior mice and evil deadly weasels. I was inspired by that and strove to give that scene as much weight as possible. I wanted to capture a moment in time where it was just the absolute chaos of battle as those forces clashed and fought. But also, in order to add a different texture beyond just drawing tons and tons of detail, I tried to draw little stories within the story. 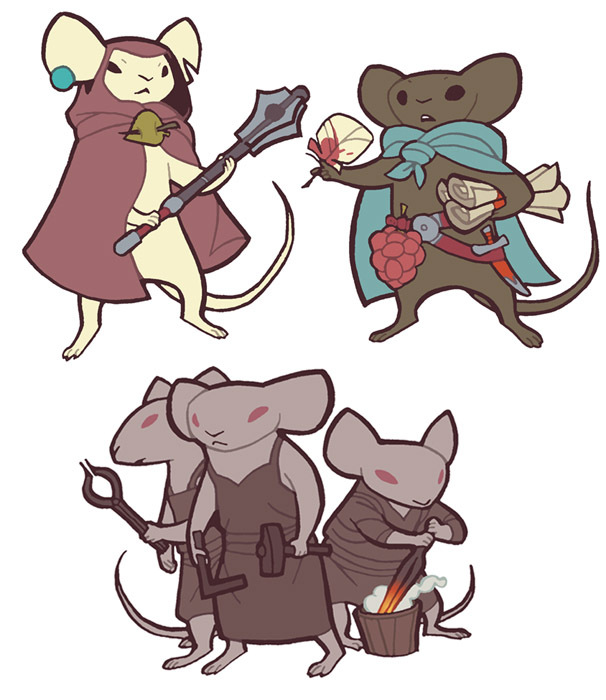 I tried to give groups of mice their own set of characteristics, their own personalities. I scrutinized the weasels and convinced myself that they weren't all evil just for the sake of being evil. 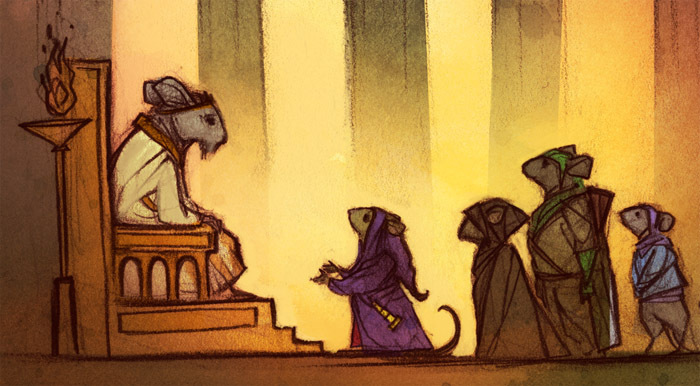 I would think, "I bet these mice over here are all pals and train together," or, "I bet this weasel in the back isn't sold on this whole idea, but he's involved only because he was bullied into it by the others." That type of thinking allowed me to compartmentalize the task into smaller, more manageable sections - which made it less of a daunting task because it stopped being about the details. 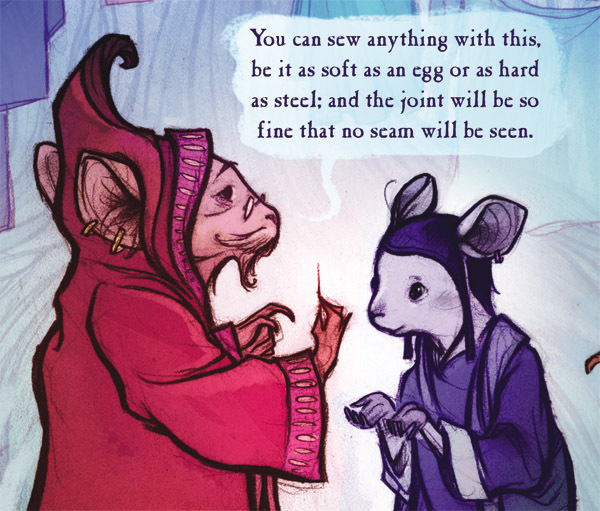 Most importantly, it allowed me to believe each mice and weasel I drew had heart. I believe that's an essential aspect any big battle scene like that - I have to care one way or the other for the people involved or else seeing them get hurt or watching them win feels a little empty. David: What is your process of going from a script to the inked pages? Do you transfer thumbnails to larger board? or do you essentially redraw them all on the final surface? 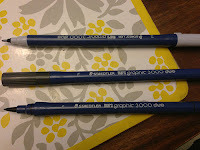 What tools do you use when penciling and inking? Eric: I draw with the most rudimentary materials. I'm the least professional when it comes to the inking and penciling tools that I use. I say, whatever gets the job done. My main inking tool is a brush marker that's made by Staedtler Mars called a 'Graphic Duo 3000' - which is a watercolor brush that has zero lightfast properties. Also, if there's any sort of moisture in the air, the ink will just infuriatingly smear at the least opportune time. On finer details, I ink with a really simple, disposable set of technical pens with widths ranging from 005 to 08. I used to do the painstaking process of drawing really tight thumbnails, using a photocopier to enlarge them on a bigger piece of paper, then using a light box to transfer the images onto bristol board in pencil before going to ink. But as I learned, a lot of the spontaneity of the page went away when I did that. 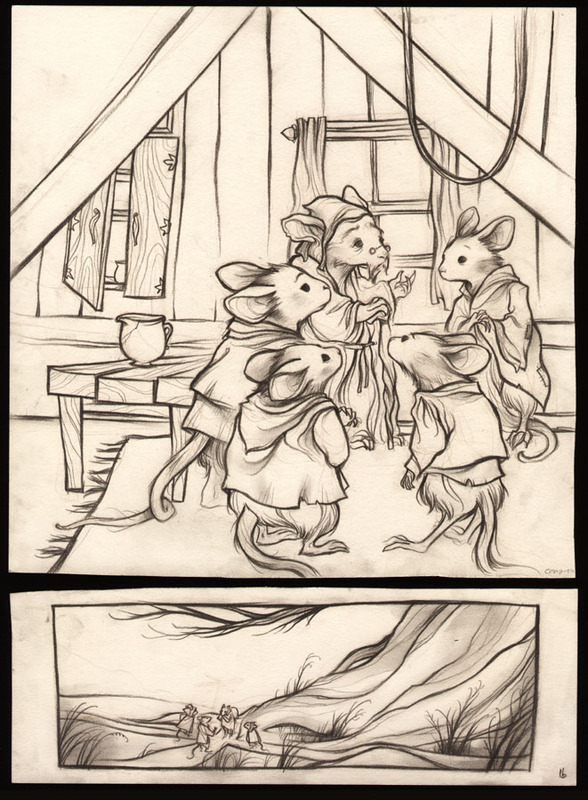 So now, I just draw a small thumbnail, then using that rough drawing as a guideline, I redraw the page larger. My attitude is, 'The simpler, the better'. David: Comic storytelling aside, you became a hero to me when you announced your new commission policies a few years ago, saying that after drawing countless Iron-Man, Bat-Man, Wonder Woman, and every other major character you wanted to only do original drawings in the spirit of certain characters. I know you’ve covered this before, but for the readers of my blog would you explain why you made that decision, how it’s been received, and after over a year of doing it how you feel about it now? Eric: That's very kind of you to say. It's been a challenge to stay relevant to an audience who clamor for that sort of fan service, but I think that this new policy I've adopted speaks toward my over all mental and artistic longevity. The story goes that I was in Lucca, Italy drawing for a fans who've never seen me in person and who were very kind to drop by my booth to buy a copy of my art book called 'FOTO' published by Lateral Studio. It's typical in European conventions to draw free sketches with every purchase and considering that I was there under the good graces of my publisher, I was more than happy to oblige. Whenever a fan would buy a book I caught myself asking them to choose a character for me to draw and when they did I would get to the task of drawing that character. Only this time, I'd recognized that I no longer had the same fervor that I used to have whenever someone asked me to draw for them. I guess you could say that I just wasn't into it, but I believe it was more than that. And until I found out what the reasoning was, I felt terrible about charging good money to people if I wasn't investing myself in each of the drawings. I didn't think it was fair and I didn't thing it was right - they came all this way to meet me, they had spent their hard-earned money in supporting my books and I couldn't even give them something (even if it was only for a brief moment) I was excited about? Like I said - that wasn't right. After that experience, I went home and did some hard personal evaluation. The simple version is that I had drawn SO MUCH fan art which I updated on my blog, that I had inadvertently drawn any and all characters who I'd wanted to draw already. I spent five or six years drawing for myself or at conventions for other people (all the versions of Character X, Y and Z) that all the while I had somehow run out of an artistic opinion about them. Does that make any sense at all? Put simply, I had drawn so much... I don't know, let's say... Captain America, that I had simply nothing else to say about the character now. And it stopped being fun. So instead, I would inform people who were interested in getting a commission from me that I have a policy called '"n the Spirit of...". Basically it meant that I would decline their request for drawing Captain America specifically, but I would be more than happy to draw my version of Captain America for them. Sometimes they'd decline for whatever reason - and I respected that. But more often than not, they'd see it as an exciting opportunity to get something new and original, and they'd be totally excited to be involved. It's been a year a few months since then and it's still been a pretty exciting endeavor for me. The point of the whole thing is that I wanted to make sure that each fan willing to pay me money for an original is getting all my time and effort. With this new policy I find myself vested, excited, and most of all, I've found that the fans of my work are VERY happy to walk away with something that's not the typical fare. People are really amazing when they're given an opportunity to be. That's what I love the most about my fans. David: When you aren’t storyboarding or making comics, what do you like to do for fun? Eric: There's hardly any time for extracurricular activities these past few months. But any time I can get away, I love spending time with my fiancée Cassandra. She's an accidental comedian, so she knows how to crack me up without even trying. We do really super-simple activities like go to movies and different places throughout the city. I've been such a home body throughout my life that experiencing new things when we go exploring is really easy. We have dogs that we love taking for walks. The sort of adventures they get themselves into in a the span of 45 minutes is pretty entertaining. I know this sort of sounds mundane and boring, but I get a lot out of it because I spend a bit too many hours sitting behind the desk. Exercise is huge for me. I try to maintain a consistent work out regimen, but that can be challenging due to deadlines and daily things that get in the way. But I am convinced that health and longevity is an important investment you have to make in yourself so as best as I can, I try to eat well, work out 4-5 a week and get regular sleep. Eric: I'm on a huge sabbatical from doing anything that's going see publication or air any time soon. I'm just working on the next phase of my career and right now that involves the simple act of actually working and not talking about it. I'm not trying to be vague, but when the time comes, it'll be easier to talk about. I hope that makes sense? 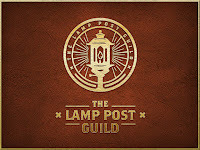 In the mean time, fans of your blog and your books should really keep an eye out for 'Legends of the Guard' - I would love to hear their thoughts and feedback about my contribution. David: I think that's pretty exciting, it means big things are in the works :) Thanks again Eric. 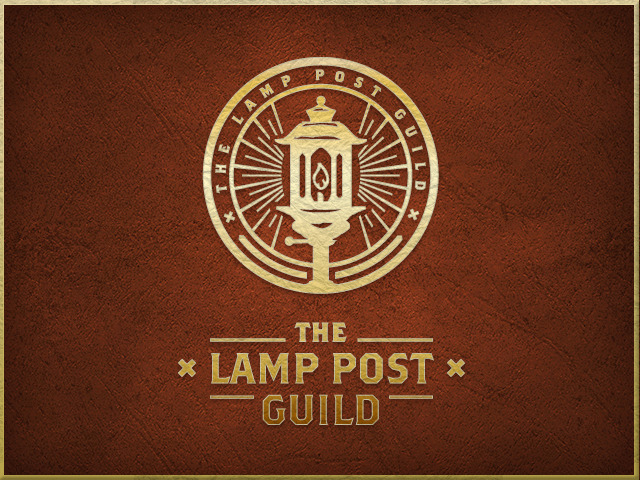 Where should Legends of the Guard fans find out more about you and your work? Eric: It's my pleasure, David! They can find me in the usual social media haunts. My blog is updated less and less frequently these days: kahnehteh.blogspot.com. 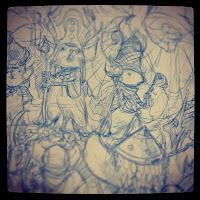 I have joined the present and opened a Tumblr account: ericcanete.tumblr.com. 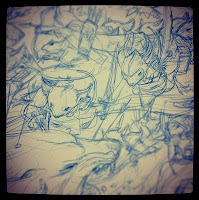 And if you want to track me in my semi-daily shenanigans, I'm on Twitter more than I should be: @EricCanete. Thanks again for the interview and the opportunity. David Petersen: Charles, It was great to have you on board to tell a Legends of the Guard story. I’d like to start by talking about your own comic series (with collaborators Mike Raicht & Brian Smith) The Stuff of Legend. I consider it to be an all-ages series. 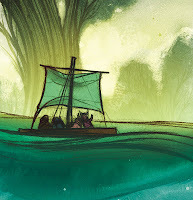 How do you artistically handle telling a story that will be read by adults and children? Is it something you work at and think about or just a natural subconscious process? Charles Paul Wilson III: Something we encountered early on after our first book's release was while we felt it was all ages, it wasn't completely all ages. Especially after meeting a lot of readers at comic conventions who feel comfortable letting their eight-year-old read it but hold off on handing it to their younger ones. Paraphrasing Mike Raicht, I've started saying it's ages Empire Strikes Back and up. But I still try to be as accommodating as I can to the youngest reader we can get our book in front of without compromising what we've established in our first book or sacrificing areas of story we feel should go a bit dark.For those unfamiliar with The Stuff of Legend, it's about a boy who is kidnapped by The Boogeyman and dragged into another world populated by the boy's lost and forgotten toys. His current favorite toys mount a rescue mission to go get him and when they arrive in this other world they become realistic versions of themselves - the toy soldier becomes a real soldier, the teddy bear becomes a giant, ferocious grizzly and the jack-in-the-box becomes an acrobatic jester. And there are a lot of different characters they encounter and a variety of places they travel to in their efforts to get their boy back. I should also mention it takes place in 1944 (it's a bit of a period piece)! David: For your Legends of the Guard story, you wrote and drew the story. Did you find it hard to exercise the writing muscle, or was it a natural extension of creating a story through images? Charles: Ha ha yeah, kinda. Planning a story for someone else with a limited page count, I think it was a tough first time. I've always liked writing stuff for myself, whether it's just words on paper or in the computer or I want to draw them out, I still do, but I felt a bit nervous, and excited, contributing both story and art. David: Did you start the story development with a script or an outline, or did you just start sketching story beats? I know we talked about story ideas, but I don't know your full process. Charles: Once you and I figured out what I was going to do I wrote down some captions that wound up in the middle of the story. They were the first things that came to mind and wound up staying through to the finish and then I worked through thumbnail drawings and wrote it out as I went along, if I remember it right. It kinda came together by itself in the end though. I do remember asking myself what I was focusing on concerning areas of the plot and why they were important, and then I made story around them. 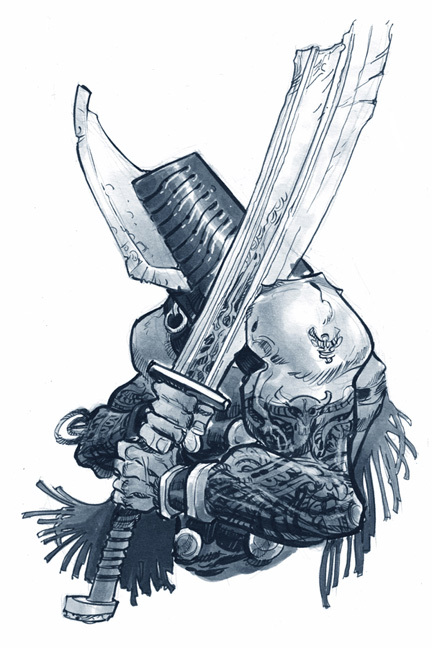 Like our main character's wooden sword, what it says about him that he made it and how he intends to use it and what his foes' weapons, what they are or how they were probably acquired and how they're intended for use, say about both his foes and him in contrast. David: The text for your story is all told in rhyme. What led you to that choice of wordplay? Charles: I think it was originally supposed to spark some direction and help me get to where I was going. I looked at myself and tried to think of something creative and fun I could do with my story, something that would maybe contribute to the whole of the book. Maybe something that could sit alongside all of the other storytellers' stories without embarrassing me too much, maybe, but mostly it was a fun aspect of putting the story together. David: Your story “When Moles are Around” deals with an unlikely friendship between a mouse & mole that has both good and bad consequences. Where did the idea for this story come from? 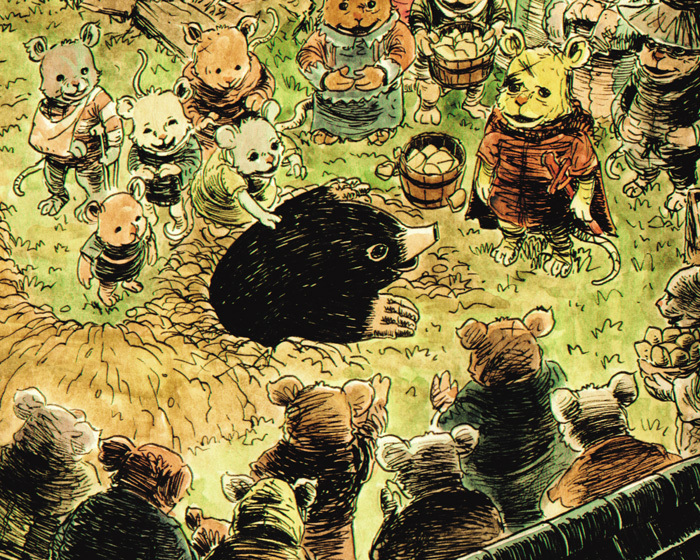 Charles: Initially I wanted to write a story with mice interacting with wolves. 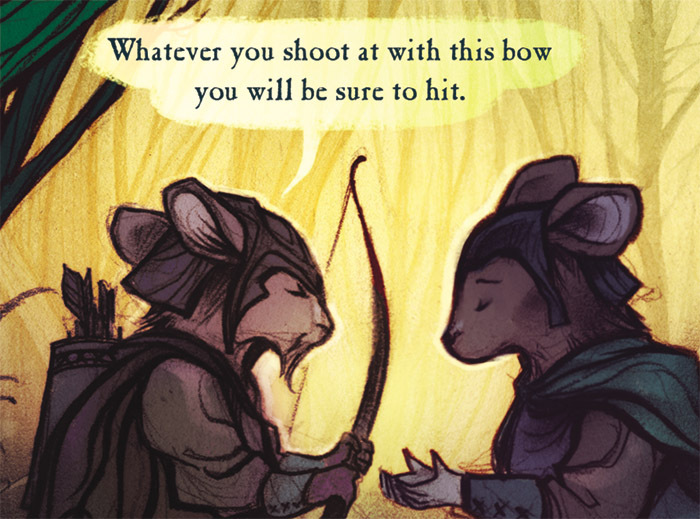 I went back and re-read all of the Mouse Guard books and found some references to wolves, but my ideas began to look like other mouse versus predator stories that were already told and I was also concerned my offering would fall more on the bland side of things. And it would have. So instead of a versus story I thought I'd make a buddy story and asked you what relationships would be like between mice and moles or rats. And you said something like mice probably wouldn't get along with moles well, that they'd dig up their housing foundations, and so I ran with that and worked it into and throughout the story. David: The baddies in your story are pretty gritty and nasty, which I love. Was there a backstory or reason you pushed them in that direction and wearing bones and shells and such? Charles: I think I remember imagining them as pirates, or plunderers, and they would wear outfits made up of leaves and sticks and whatever else was lying around. And that some of their outfits were made up of animals they've killed, but more telling would be what animals. 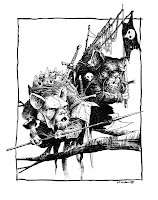 One of them wears a small turtle shell, which would suggest this mouse killed a young, slow moving animal, and the leader has a bunch of baby bird skulls tied to his back. So essentially they're bullies who pick on weaker animals, or kill them and take what they want. Their insignia is a baby bird skull, probably due to some backstory with the leader. Maybe he couldn't kill a full grown bird so he went after its children, or maybe those mice developed a taste for bird flesh and somehow they thought the bird skull insignia would best represent what they are, or maybe it's a joke. David: Is there a moral or take home lesson in your story? Charles: I think there are a few things that can be pulled from the story that would serve as a moral or lesson, none of them my intention really, but what I like about it is two friends creatively, purposefully and inadvertently, find ways to triumph over adversity on all sides and remain friends. David: On my blog, I talk a lot about process and materials, and my fans are always really interested to know about that stuff too. 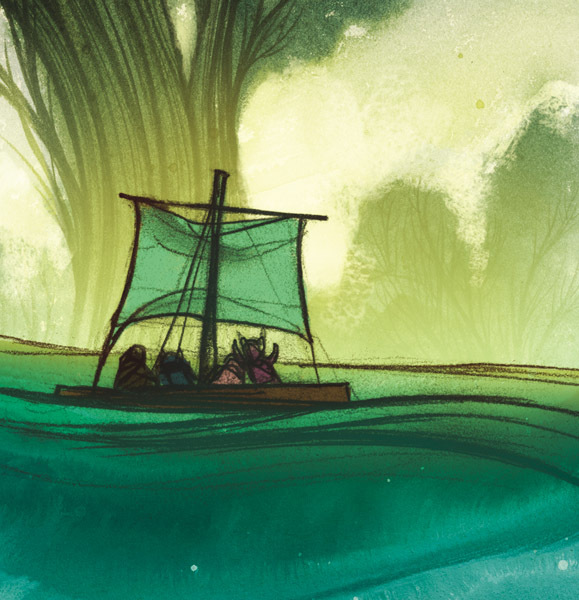 Walk us through the process from rough to watercolored page for this story. And tell us the materials used. Charles: For this story, and I don't always work this way, but for these pages I started with small thumbnail sketches for each page. Sometimes I work bigger. I laid out the lettering as well as the illustration in the thumbs, but I planned on working with the word balloons and caption boxes more closely than I would if I were to hand it off to someone else so I made sure I knew how they would function with the art on the page before I started. 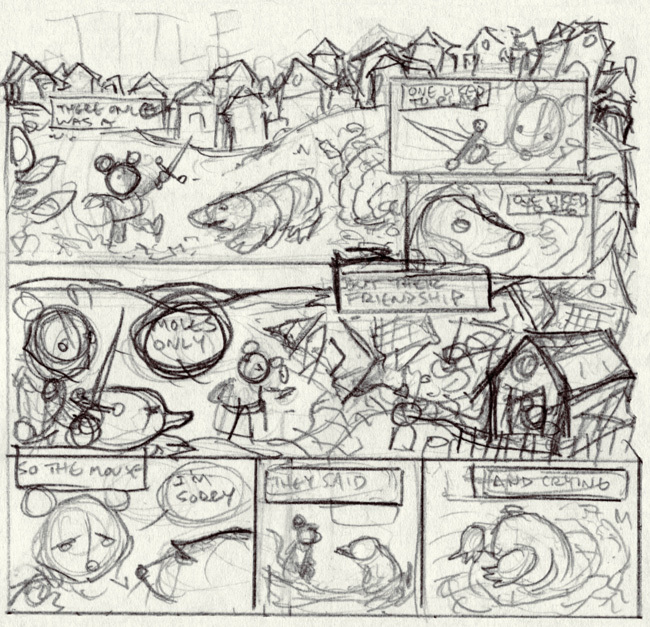 Anyway, I usually do thumbnails sketches or roughs on typing paper. I then took the thumbs and, using a photocopy machine, blew them up until they were about 10"x10" each. I sometimes use a computer printer for this. It can be more precise and before I print I can use photoshop to move things around if I want. Panels, figures, whatever. I used 11"x14" Strathmore Bristol paper (the yellow pad), 100 lb. smooth as the final paper. There's thicker paper out there that buckles less with watercolor and washes but I guess I've gotten used to this. After ruling out the image area on the final paper (10"x10") I lightboxed the layouts up. 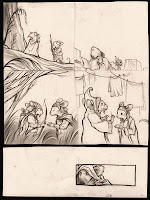 I've been favoring softer pencil lead so I probably used HB or 2B when I penciled the pages. For inking I used Micron pens. I traveled a lot last year and with Microns I could work over pages almost anywhere. Using the lightbox, I drew the word balloons and caption boxes on separate sheets of paper. I hadn't hand-lettered anything in a long while so it took a few tries until I got it how I liked it. I have an old Daler-Rowney watercolor set I drag with me everywhere too, and I used those for color. 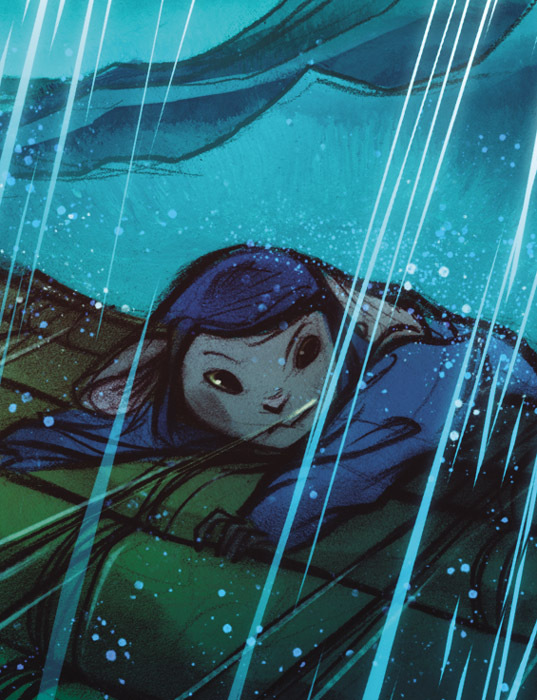 I scanned the art and letters into photoshop, made adjustments in color and lettering placements as well as some lettering corrections and sent the pages off! David: How do you work best? in silence, around others? with the right background sounds? Charles: Depending on what I'm doing sometimes I like it quiet. Especially during script-reading and thumbnailing pages or roughing out anything in general. Sometimes I like music during the thumbnail process, but even then that primarily consists of putting a single track on repeat for hours and hours on end. In all other stages, and again, depending on what I'm doing, I could also listen to tv shows and audiobooks, or more music and quiet. And sometimes I like to Skype with my friends while they draw. I also found this great Magic Window app for the iPad that plays ocean, lake and wind sounds with some moving scenery, and that's nice to have on while I draw. David: What do you have coming up next in your list of projects we should look out for? Charles: We're currently wrapping up The Stuff of Legend, Volume IV: The Toy Collector with two more volumes to go! And this summer I'll be working on a book called WRA1TH with Joe Hill (Locke and Key) that ties into his NOS4A2 novel that was just released in April. I also have a slew of variant covers coming out ranging from Wild Blue Yonder and X Files to Regular Show and possibly a web strip I've got in the works called BEWARE THE STARE! David: Wow! That's a lot going on! Charles, thanks for the interview, and for the story. Where can people find out more about you and your work? Charles: You can find me on twitter @cpwilsoniii or on facebook (Charles Paul Wilson III). Original art and commissions can be purchased/arranged through Bob at www.comicarthouse.com (email -bob@comicarthouse.com). And if you're on deviantart you can find me at www.cpwilsoniii.deviantart.com! David Petersen: Cory, I really appreciate you doing a story for Legends of the Guard and for doing this interview. Let’s start with your background in art. Are you one of those people that started drawing before they could walk? Did you have an artistic family member? Were you enrolled in art classes? Did you go on to college or art school for it? Cory Godbey: Hey, it's my pleasure! Yeah, my background's not all that interesting. It's true I was one of those kids. I just liked to draw. One story that I've told before is from Kindergarten when I was five. I remember we had to draw what we wanted to be when we grew up. I had no idea (since Super Mario was probably out) so I just drew a policeman. I gave him one of those old time-y cop hats, you know, with the badge on the front, and I vividly remember sitting there thinking, "Hey, that looks pretty good." I didn't go to art school, exactly, but I majored in art in college. I feel largely self taught; I saw the work I wanted to do and pursued that learning from everyone I could find. From my own friends to Peter de Sève and Carter Goodrich, to the Golden Age Illustrators, to Maurice Sendak, I couldn't get enough. David: You were headed on a more illustration type trajectory and started dabbling in comics. Can you talk about the Flight anthologies and your involvement and stories? Were those your first comics? Cory: Sure, I think that's what lends my comics work some of it's interest. Or maybe another way to put it is that's when people comment on my comics work that's what they notice. My background is illustration, especially fantasy illustration, and that's always been my passion. I love drawing and painting. I love creating a series of pieces that tell a story or give people an imaginative springboard to spark their own ideas. I'm drawn to that field because it marries together so many of the things that I prize: draftsmanship, creativity, imagination, storytelling, all that. And comics are great because naturally they do the same. I feel right at home. It can be tough for me sometimes to spread all the energy over the course of so many pages and panels (rather than pouring everything into single images) but I enjoy the challenge. My involvement with Flight stemmed directly from my personal work and my love of picture books. I completed my first serious personal project, Ticket in 2008. I had met Kazu Kibuishi in 2005 at BookExpo in NYC (Flight was in it's second volume at the time). We talked a bit and he was just really kind, generous. He told me that when I felt I had something to show to feel free to send it his way. Once I had finished Ticket I thought, ok, I finally have something to show for myself. I wanted to send it to Kazu just to say thanks. We hadn't kept in touch since 2005 but I reached out in 2008 and told him that I was going to be at San Diego Comic-Con and I wanted to drop by and give him a copy. Next thing I knew Kazu was introducing me to the Flight crew saying I would join the sixth volume. Beyond any comics I made in grade school, yeah, my work in Flight was my first comic. 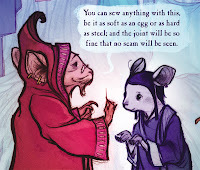 The sequential nature of Ticket (and picture books in general) was good preparation for it. David: Well, "Miss Cory Godbey" (If that's what the queen calls you, why should I differ? 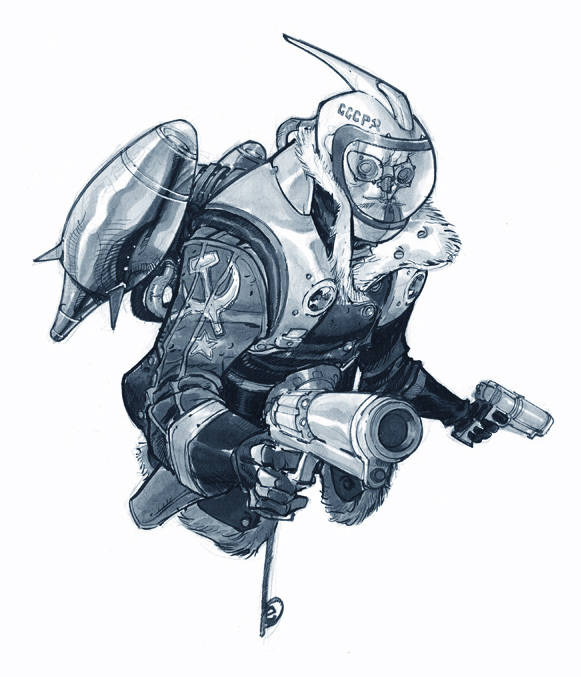 )...When thinking about a short story for comics like your Flight stories or your Legends of the Guard story, how do you start? Do you start sketching, note taking? script writing? Cory: I draw my stories out in words first. My notes sprawl across pages and pages. It's a mess. It's almost indecipherable. Then I do pretty rough thumbnails based on all the notes. 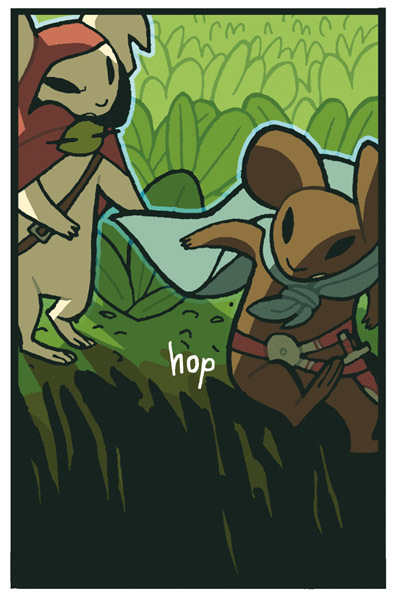 I work to find the panels and pacing. 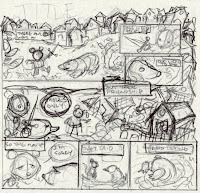 From there it's usually a digital rough (meaning I scan the thumbnails and do a quick digital pass to strengthen them). David: When you turned in your original draft/rough for your Legends story is was something like 18 pages, and you told me that you had over-shot on page count with your Flight stories too. Do you find this method of overtelling the rough helps you trim and cut the story into shape? or do you see it as a troubling process of making tough edits. Cory: Ha ha, yeah, my first Flight story, Walters, was exactly 60 pages. I was excited at the chance and wanted to show off a lot of huge illustrations, lots of single page pieces, several double page spreads. It just wasn't necessary. I edited that down to 40. It made the story tighter and it read much better. It was absolutely the right call on Kazu's part. It's interesting (to me at least) because I think coming from illustration I want to tell the story in a single image and so to rethink that impulse and tell the story sequentially is a slight gear change. In writing, I've found that I just prefer to stretch out completely and write it (and thumbnail) exactly how I mean to then take stock and edit. It does help me decide what's most important and what could go. 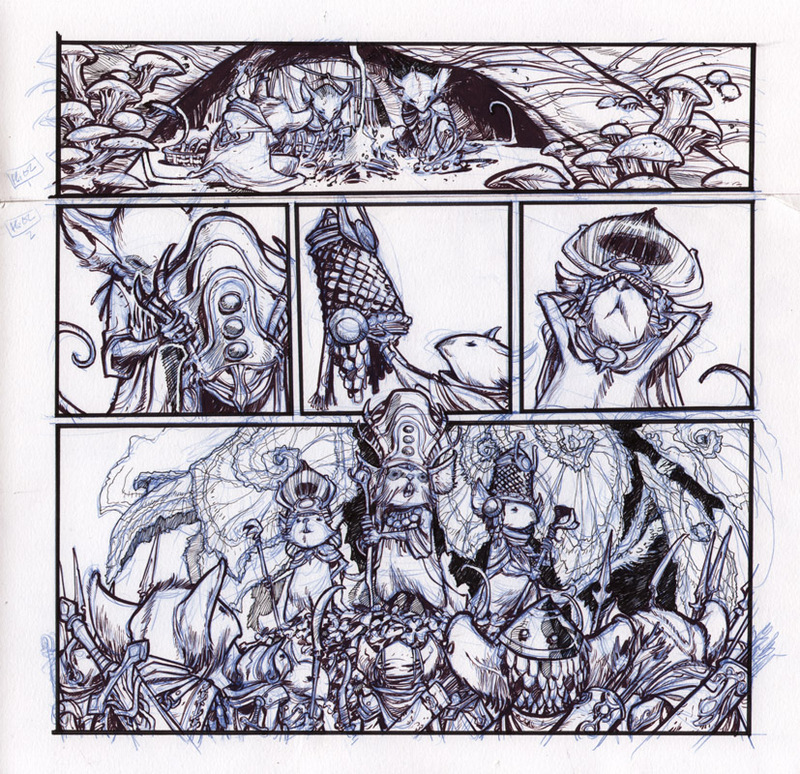 And to think, for my most recent Labyrinth comic (released on Free Comic Book Day) I was given four pages. David: Your Legends story is a retelling of an existing folktale. Talk about that story, why you chose it and what Godbey-esque changes you made in the adaptation. Cory: Like most people, I think, I've always been drawn to fairy tales. 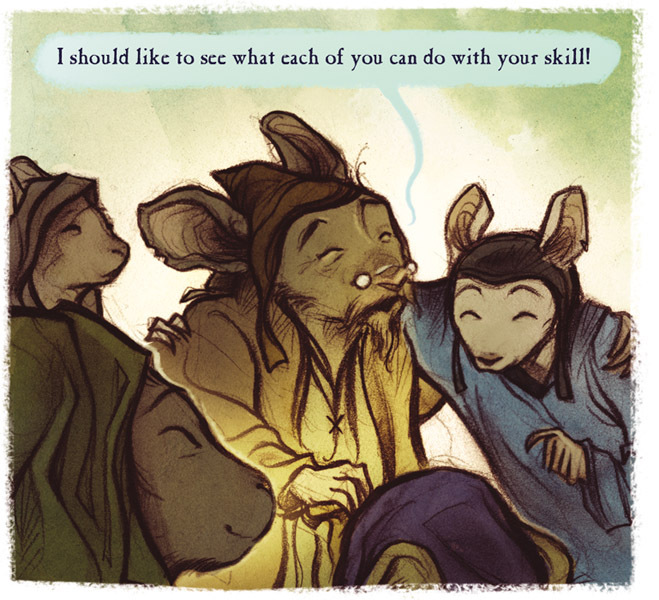 Adapting a story like "The Four Clever Brothers" let me play with a collection of mice and explore their personalities through the skills they acquired. 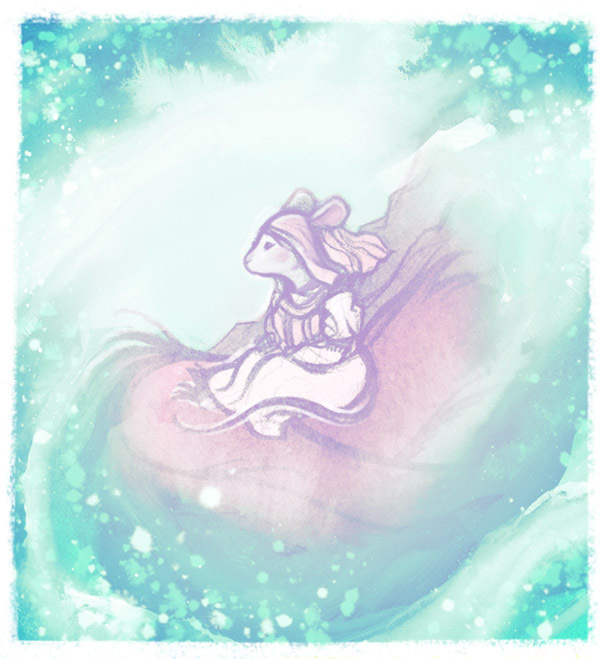 Illustrating that particular fairy tale has just always been something I wanted to do. Legends was the perfect excuse to do just that. Plus, dragon. Or beast. Or massive princess snatching creature, whatever you'd like to call it. David: When it’s time to do the final art for the story, what is your process? What are the steps you take and with what materials? Cory: Once I finish the digital roughs and assemble the story into a PDF and it's approved I'll begin the actual illustrations. I struggle with forcing myself to draw in comic panels, everything collected and arranged on a single page. I dislike drawing small, I want room to stretch out in a drawing. 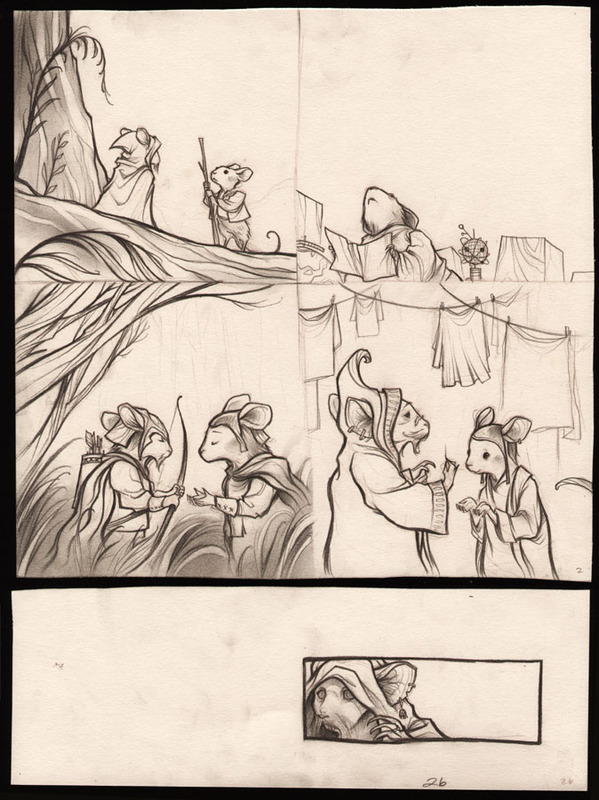 Usually, I draw all the panels separately and assemble the page after the fact. I think with this story it was about half and half. Some pages I drew in panels, the other half I drew on their own and assembled, digitally. It's only a problem for the collector, at the point, I suppose. I like having original pages but when I feel like I'm compromising the quality of the drawing because I feel cramped in panels that when I work large. The paper I draw on is a type of printmaking paper. I've been hooked on it for the last ten years or more. Here's a sad story about that paper, though: it's just recently been discontinued and I'm going to have to migrate paper affinities elsewhere. David: Did the digital aspect grow out of wanting a quicker easier way to color than traditional materials? or do you find a creative benefit from your digital colors? Cory: I like to tinker with colors. I almost never know where I'm heading when I start painting. I usually find my palette by playing (as they say, you don't wait for ideas, you get ideas by working). All of my drawing work is traditional, I really dislike drawing digitally. After the drawings are done though, it'll be a mix. Sometimes watercolor, sometimes watercolor and digital, sometimes just digital. Depends on the needs of the project and schedule. 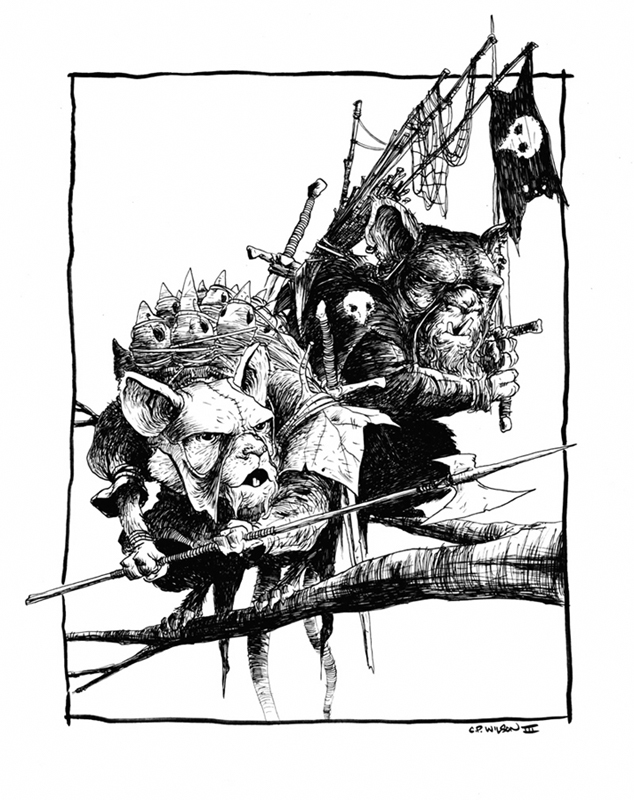 Cory: The progression of artists I've followed over the years follows along these lines: Peter de Sève, Carter Goodrich, H.B. Lewis, C.F. Payne. At the same time I stumbled into picture books, the king of which I discovered to be Maurice Sendak. I also followed David Wiesner and Chris Van Allsburg. I love the works of Trina Schart Hyman. Golden Age heroes include Arthur Rackham, Edmund Dulac, John Bauer. 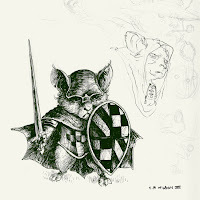 Studying those artists led me to follow Tony DiTerlizzi, Charles Vess, Brian Froud, J. B. Monge, Paul Bonner, and Petar Meseldžija. Other favorites are James Jean, Sam Weber, Sam Bosma, Kazu Kibuishi, and you know what, yourself too, Mr. Petersen. David: Awww, thanks Cory. 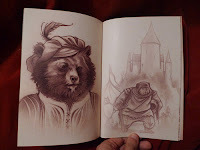 Every year you do a ‘personal project’ which is then published as a nice thick sketchbook with an overarching theme (past years include The Hidden People & Menagerie) Each one has the sense that what you show is a very rich portion of a much larger world. Do you have plans to ever delve deeper into those subjects, or do you feel that the books represent what you had to artistically say about them and leaving the audience wanting more is a good place to leave it? Cory: Ha ha! I know what answer you're looking for, David. Let's see if I can make this satisfying. Yes, every year I do one big personal project, one big new series of work. I've done this for the last six years. In my experience I haven't found anything that has benefited my career, portfolio, and reputation quite like creating yearly series of personal work. I work on it in and amongst my client work: plan a new series and work on it over several months. The next step is then to collect the work in a sketchbook, usually. And the fact is, it's been my personal work that's generated most of client work over the last few years. So in that regard, making the time for my personal work is just as important as my regular client work. 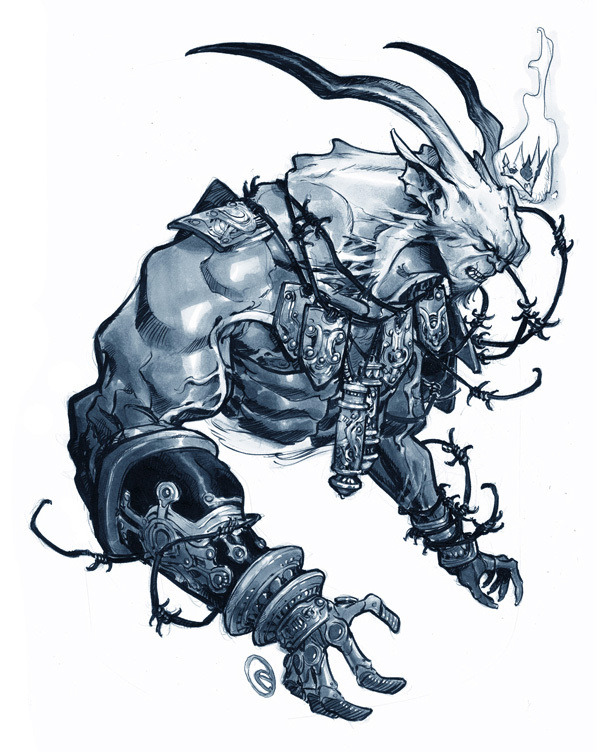 I can trace a direct line from my very first personal project Ticket, 2008 to the Labyrinth project from Archaia and the Jim Henson Co.
Ok, enough of that, here's the answer I think you're looking for: Part of the reason I got on this track was I just wasn't satisfied with my work. I had a bunch of stories I wanted to do but my drawing wasn't up to where my imagination was going. I set all of those aside for the time being and poured everything into bettering myself artistically. It's only been in the last year, really, that I've gotten back into any writing. It's something I love and something I'll always be pursuing but a quote by William-Adolphe Bouguereau expressing the sentiment perfectly, "And can there be such anguish compared to that felt by the artist who sees the realization of his dream compromised by weak execution?" David: What hobbies do you have when not drawing and telling stories? Cory: Other than that I ride my bike a lot, travel with my lovely wife Erin, and wrangle our four cats. And the usual I guess, books, movies, and some video games. Cory: The next one is great; I've partnered with a writer to illustrate a collection of short stories. If you at all enjoyed my book, The Hidden People, you're going to love this new project. David: Cory, thanks again for doing the story and interview. Where can people find out more about you and your work? 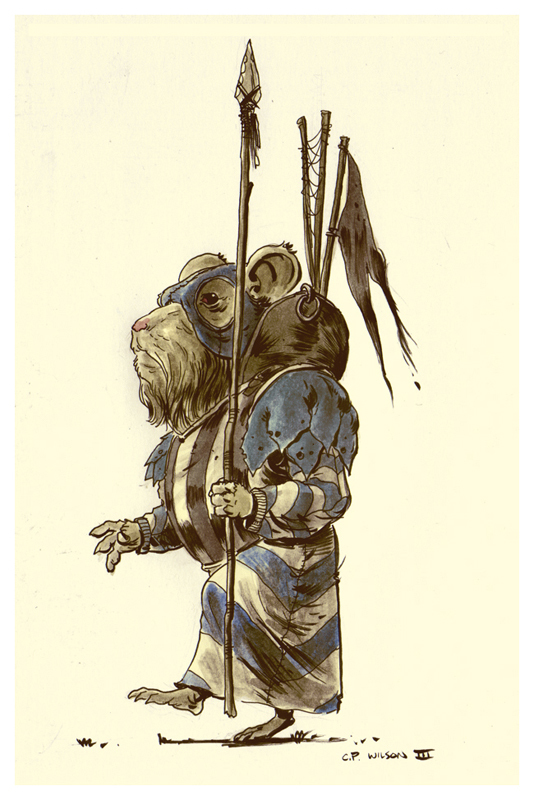 Twitter: @corygodbey Which, as it turns out, is the best way to reach me. David Petersen: Jemma, I really appreciate you doing this story as well as this interview. What is the work you are most known for artistically? Jemma Salume: Most people know me for my cover work for Boom! Studios (Adventure Time, Candy Capers), but there's also fan projects like my Skyrim Valentines and superhero redesigns featured on Project:Rooftop. David: What is your background in art from an education standpoint? Did you take classes or go to school for art? Jemma: I studied illustration at the Academy of Art University in San Francisco, and prior to that attended an art-emphasis boarding school in high school. There were also countless extracurricular art classes before either of those - I was fortunate to know what I wanted to do very early on. 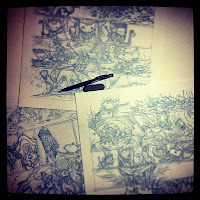 David: You've written and illustrated Captain Kitten before, but how different was it working on your Legends story? or was the process not very different at all? 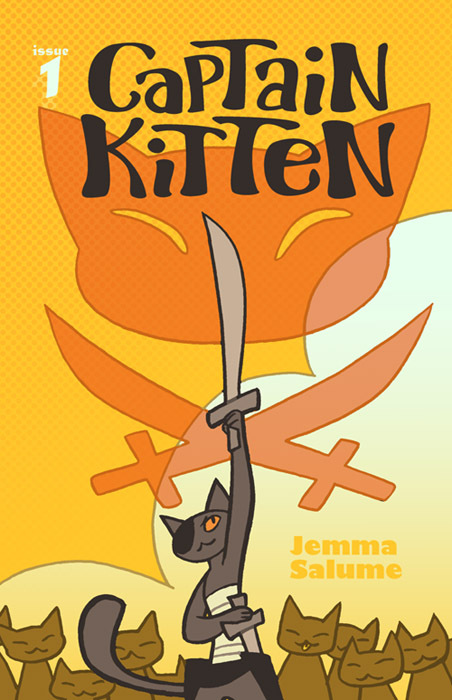 Jemma: Captain Kitten was very "throw things at the wall and see what sticks" comic… It was originally conceived in a conversation with my friend Katie Longua (ROK), where we were tossing around ideas that sounded funny and could be turned into a short comic easily. 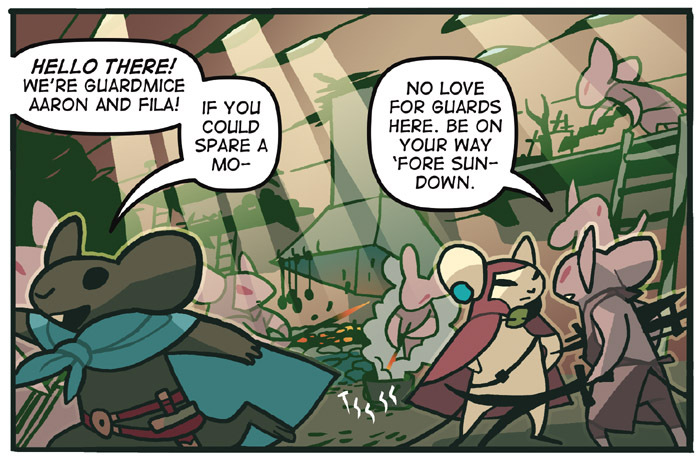 The driving idea behind the comic wasn't much more than "How can I have cats and fight scenes in the same comic?" I was focused on streamlining my process issue by issue, and over all treated it as a learning opportunity. 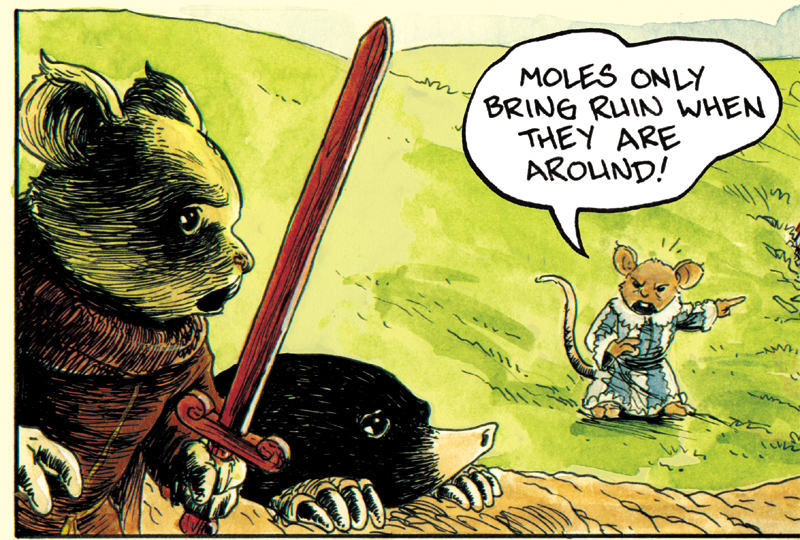 Compare that to Mouse Guard, where I was coming into it as a huge fan. 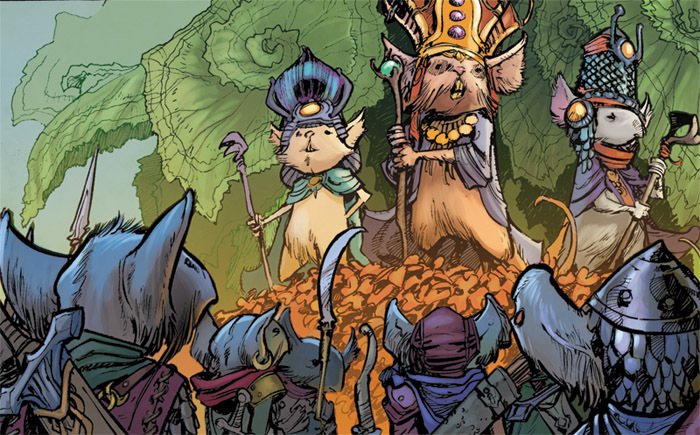 I love the juxtaposition of adorable mice and overwhelming danger! Where Kitten was about goofing around, I had a fairly rigid idea of what my Legends story needed to be and what it needed to get across. It was almost paralyzing to work on at first, but once it began to fall into the exact shape I saw in my mind, I was invigorated! I sort of feel more proud of my Legends story than my own original book, for that reason. 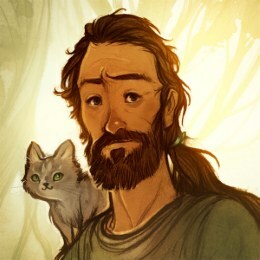 Put simply, Legends is a finished image, while Kitten is a sketch. David: When you start working on a comic story, what’s first after your story idea? Character designs, thumbnails? a script? Jemma: I think of a mood for the story initially. Even if it's in black and white, I'll think of colors and shapes that communicate that mood, and then design characters around that. 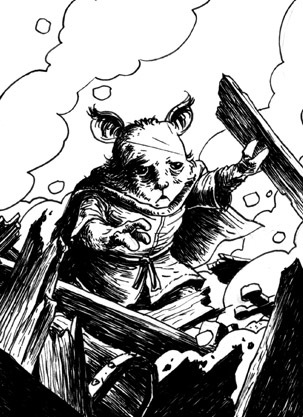 I like characters that embody the emotion they're meant to incite in the reader, like the eerie grey-furred and pink-eyed mice from my Legends story. Once I have the characters, it's just a matter of thinking of the situations they would naturally seek out or find themselves in, and how they would interact with others. That becomes a very loose script (main beats of the story with a few panel descriptions), which guides page thumbnails, which then guide the final page and writing dialogue into the script. I'm much more of a visual than a linguistic thinker, so scripts are kind of a drag for me to work on - I don't spend more time on them than I have to, and will frequently be alter dialogue right on the page rather than go into the script for another rewrite. Legends was one of the most finished scripts I've ever done, because I needed to show it to others to review and approve. Compare that to the script for Kitten, which is nearly incomprehensible -- just a bunch of scribbles to remind myself what to draw from one day to the next. David: All of your work is digital, can you explain the process of building up from a rough to the final art? 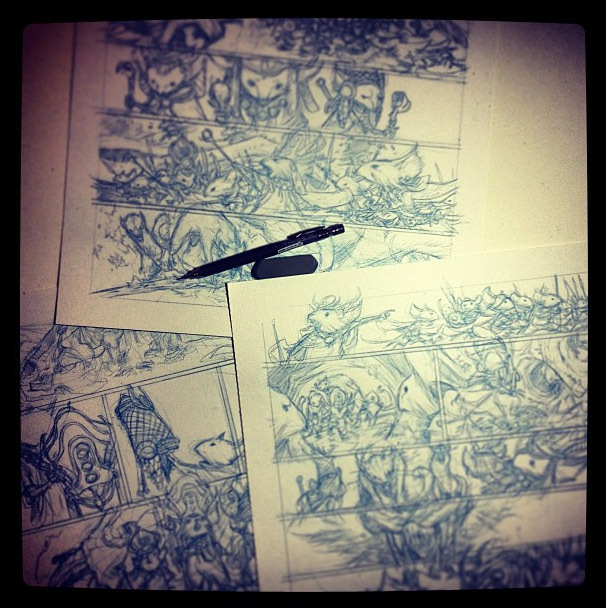 Are there similar steps to the traditional media method of thumbnails, pencils, inks, colors? Jemma: Though I would digitally, I thumbnail pages almost exactly like I would traditionally - Small rough sketches of what I want the page to look like, easy to alter if I want to try something different. After that, since everything is digital, it's simple to resize the rough to the size/resolution I'll be using for the final page. 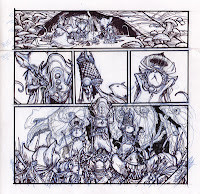 That way I can draw directly over the thumbnail, refining the sketch, inking, coloring, all of that. When I was much younger I'd always get so frustrated at how all the hand-resizing methods I was taught stiffened and deadened the impact of the final drawing, but it's much easier to preserve the spontaneity of the original thumbnail when I'm drawing right on top of it! As for the final drawings, I'm just drawing directly into Photoshop using the simplest default tools available to me - Pencil for lines, Bucket Fill on a separate layer for colors. Nothing fancy, no special brushes. That's similar to how I work traditionally, actually - I just hate bringing in a bunch of different tools when one or two will do. It breaks my concentration, haha! 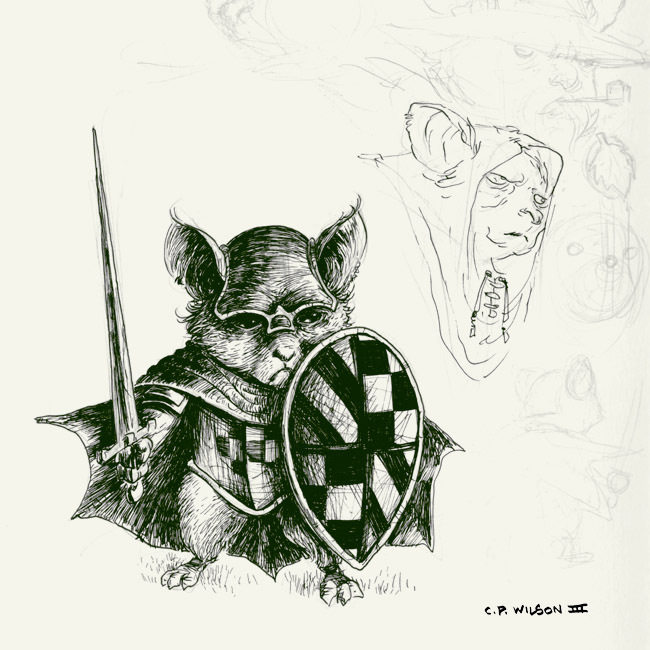 David: Your story starts with two Guardmice on patrol...one is headstrong and the other is more grounded. What made you choose these character archetypes? David: That's great. It's that tension I find fun to write between Saxon and Kenzie. Without spoiling too much, the remainder of the tale is a bit of a ghost story about a spectral owl. 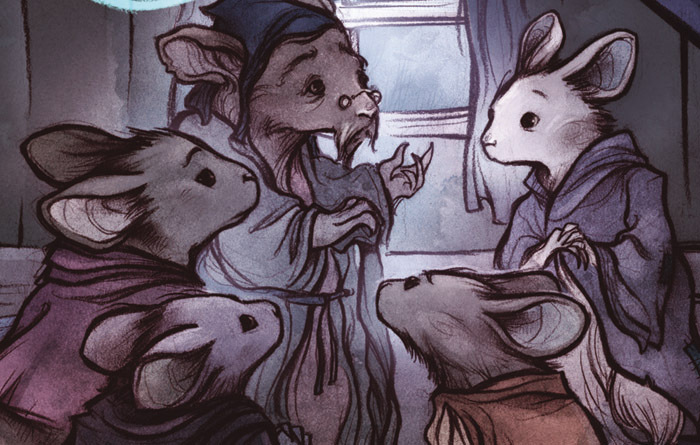 Did you start by thinking “I’d like to do a Mouse Guard ghost story?” or was there some other route to that tale? Jemma: My mind did indeed go to "Oh boy ghost story time" first, yes! I wanted to do a story with little chance of overlapping with someone else's (variety is the spice of life and all that), and a ghost story is a natural for that - Little precedent in the canon, but not strictly implausible. And ghosts are fun! It's actually surprisingly hard for me to cite direct influences because it's hard for me to look at my style that way, all I see is me when I look at it. 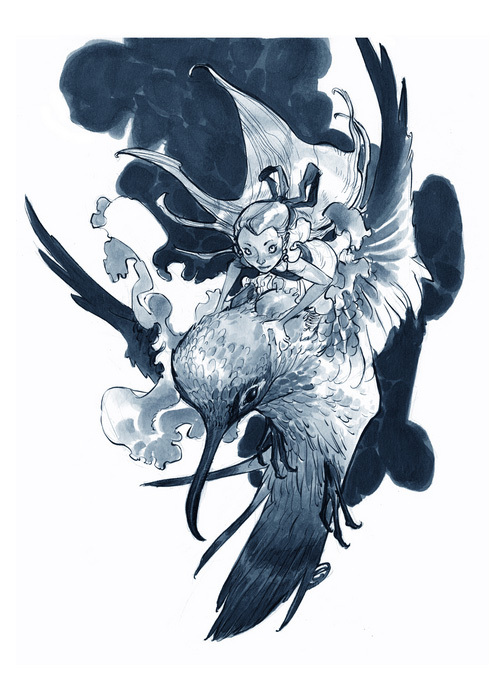 I am a huge fan of other illustrators: Mike Mignola, Daniel Krall, Angie Wang, Emily Carroll, Sachin Teng, Leslie Hung, and Dean Trippe are the ones that jump to the front of my mind. I also watch a ton of movies and animation: Any movies by Guillermo del Toro, any animations directed by Hayao Miyazaki or Satoshi Kon, early Disney films with a strong individual aesthetic like 101 Dalmatians and Sleeping Beauty - things in that vein. I also listen to a ton of music when I work, which I'm sure exerts some kind of influence: Janelle Monae and Zion T are both artists love, and I also go for non-lyrical instrumental stuff like Disasterpeace and Floex. Jemma: I've got covers for various Boom! Studios comics slowly getting released - Readers may have already seen my Adventure Time covers. 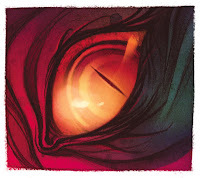 I'm also working with Dean Trippe and Jason Horn on a comic called The Secrets. I've got my own webcomic in the works, but it's still in the planning stages… Followers of my Tumblr and Deviantart have already seen images of the main characters, and they'll be seeing more related to it in the coming months. David: Jemma, thanks again for doing the story and interview. Where can people find out more about you and your work? Jemma: All of my art can be found at my Deviantart ( oxboxer.deviantart.com ), my art plus anything I'm currently interested in is over at my Tumblr ( oxboxer.tumblr.com ), and I've also got a Twitter ( twitter.com/oxboxer ) if you just want pages and pages of me screaming about things. 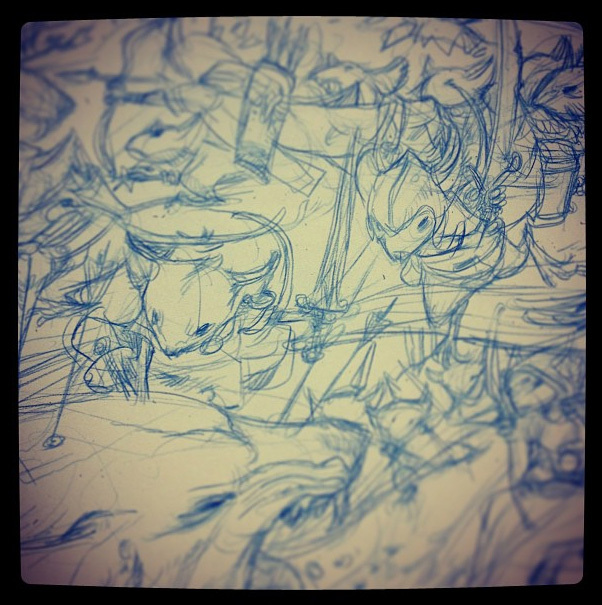 Thank you for having me on for Legends of the Guard vol.2! 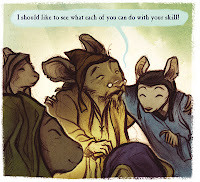 Go Mouse Guard!